Product is made of wood, decorated by clay & oil paint. It can be used gifitng dry-fruits etc in wedding or other occasions. Dry Fruit boxes are part of the wedding ceremony. They are used for holding various dry fruits such as cashew, raisins, almonds and cardamom. Made out of clay and decorated using oil paints, this unique and vibrant looking dry fruit box is a perfect adronment for every wedding. 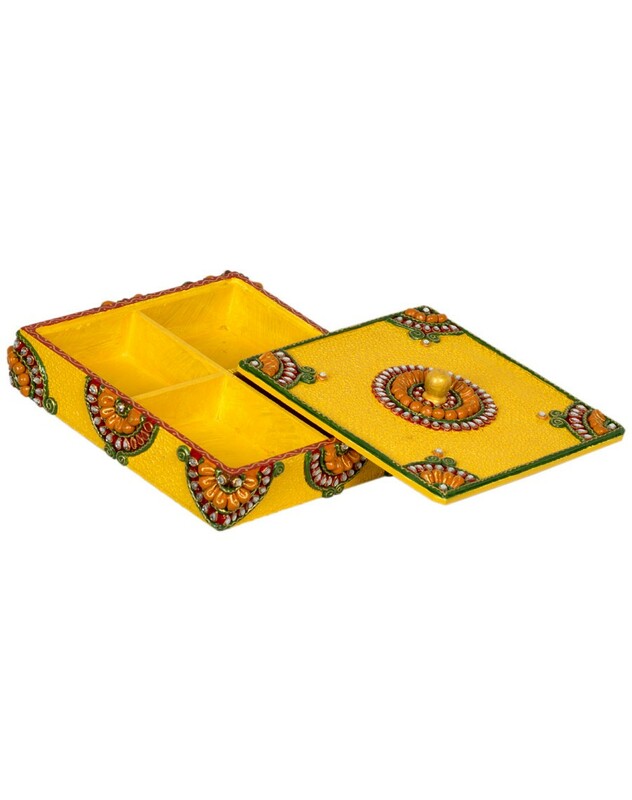 • Disclaimer: This intricate home decor / handicrafts product is handcrafted and may have slight imperfection and/or mismatch from the product shown in the image as its handcrafted by the artisan which makes the product unique.